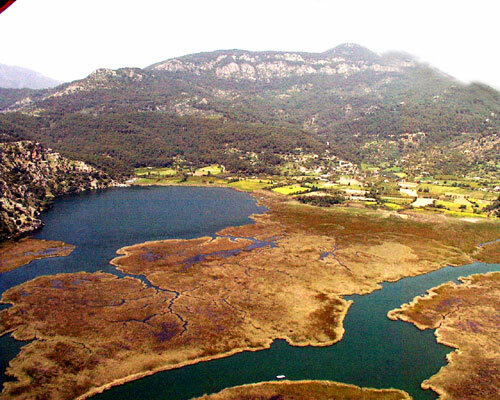 The Dalyan Delta is an area of immense natural beauty and has become one of Turkey’s most treasured conservation areas. Though the pace of life is relaxed here, there is a surprising amount for one to occupy oneself. this idyllic unspoilt village has much to offer all who visit – something for everyone all in one place and popular with all ages. Situated only 25 minutes from the airport at Dalaman, Dalyan is a charming riverside village on the South West Mediterranean Coast situated between the towns of Marmaris and Fethiye. Dalyan offers splendid scenery, breathtaking natural beauty and the experience of unforgettable Turkish hospitality, it is not surprising therefore that once you have been to Dalyan you will no doubt return. Cotton fields, orange and lemon groves and pine clad mountains surround this stunning area – a unique complex of beach, sea, lake and river. 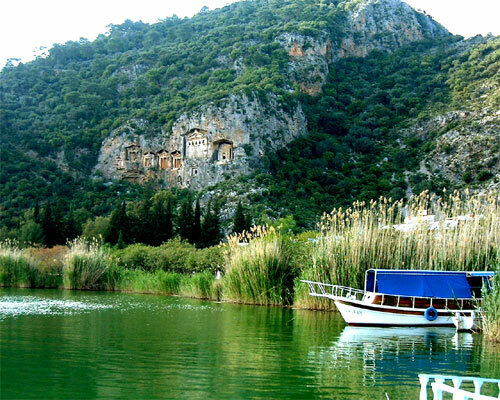 The River Dalyan meanders past the lovely village and the impressive 4th Century rock tombs carved out of the rock face. The river then spreads out into a delta teeming with wildlife – a naturalists paradise – and then leads out to the stunning sandbank known as Turtle Beach. This is famous for being one of the few remaining nesting areas of the Loggerhead Turtle as well as being very pretty and safe for children. Dalyan is a living village and people still make a living fishing and farming as they have for centuries, in Dalyan there is a delightful combination of primitive and new. Dalyan offers some mouth watering local fish and seafood restaurants, a good selection of bars and a couple of Discos. Development is limited in Dalyan, as it is a conservation area there are no high rise buildings and a ban on building work during the summer months. Please note that it is very difficult to change up travellers cheques in Dalyan, they are not accepted in the Post Office and the banks charge 10tl per cheque irrespective of the amount being changed. We would recommend a Nationwide Debit Card which at the time of writing do not charge for it’s use in Turkey, you will also get a better rate than changing cash in the UK. Photographs by Neil Hobbs where specified.